To say I’m crazy about today’s science art project is probably an understatement. My patio is now covered in rainbow coffee filters made by me and the kids. 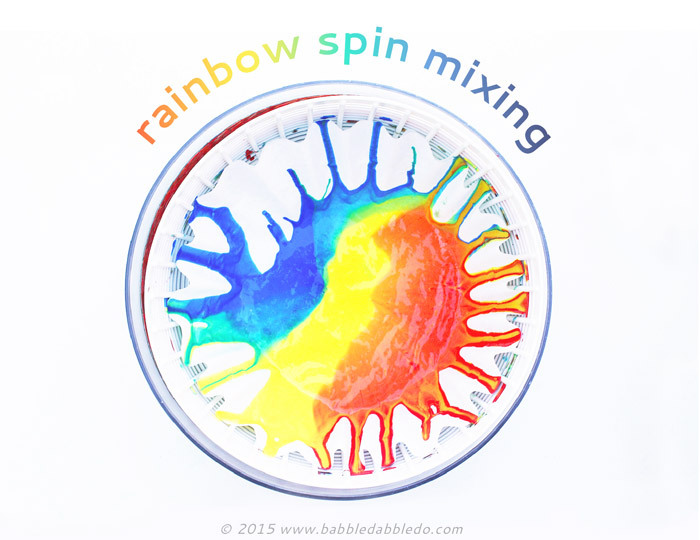 I love simple projects that demonstrate a variety of scientific concepts and today’s project Rainbow Spin Mixing does just that twice over! 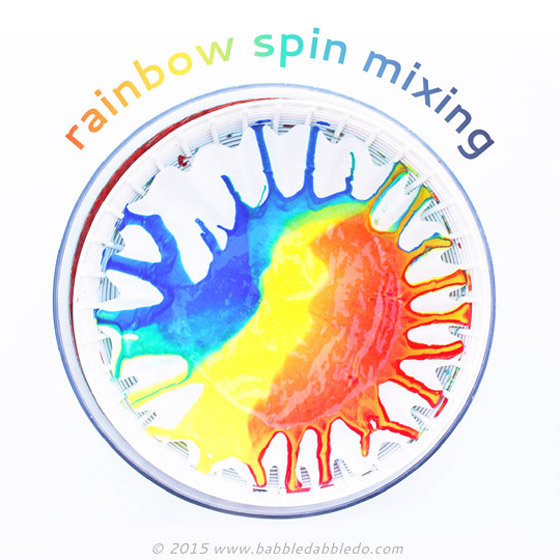 Spin Mixing is not only a fun way to create lively art but it demonstrates color theory and a little physics at the same time. 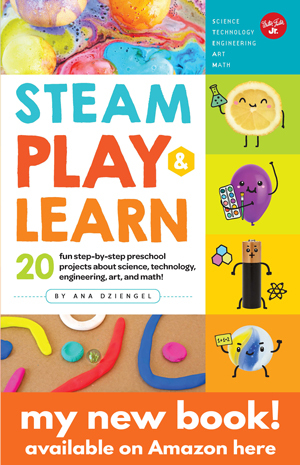 It’s a lovely idea for a simple STEAM project you can put together quickly using materials you probably already have on hand. Large white coffee filters-You can’t go wrong purchasing a boatload of these for a cheap price. Salad Spinner This one is super cheap and great for art projects! Step One Place two coffee filters in your salad spinner. Coffee filters are delicate so doubling up helps them hold the thick paint. 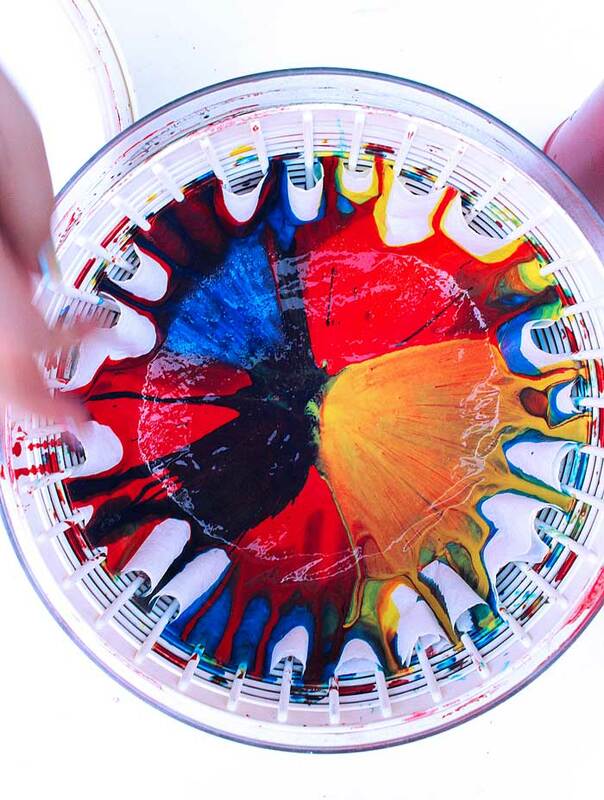 Step Two Squeeze a generous amount of red, yellow, and blue paint in the center of the filter. You can try squeezing it in concentric rings or next to each other. Step Three Place the lid on your salad spinner and give it a good whirl. Open it up to see color magic! If desired add a second batch of one or two colors and spin again. Voila! You should now have a filter with secondary colors on it too: green, purple, and orange. Depending on how much of each primary color and the order in which you added them you will get more or less of the secondary colors. I tried to get a precise rainbow but never quite made it. For the closest approximation start with a small dollop of red at the center, followed by a circle of yellow, then blue, then another circle of red. 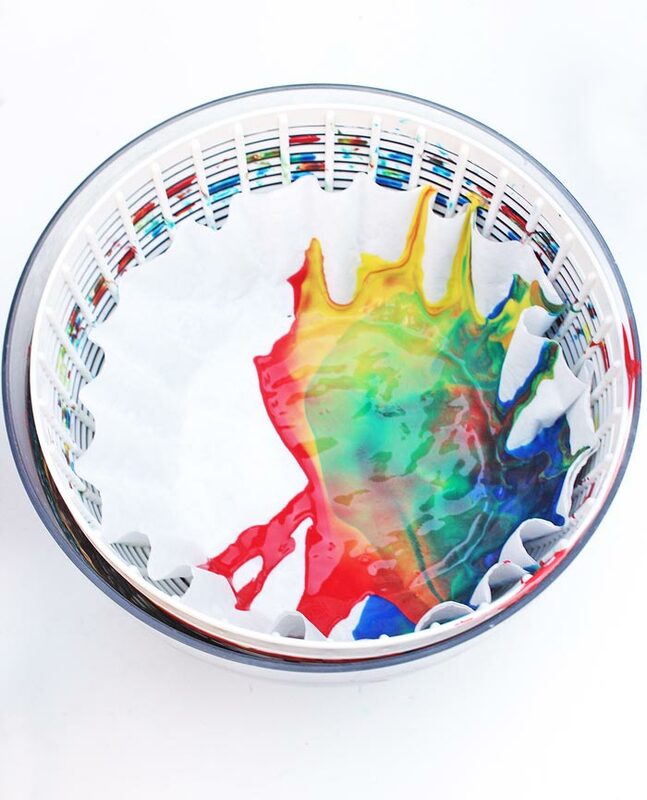 Prep these for an enhanced rainbow effect. 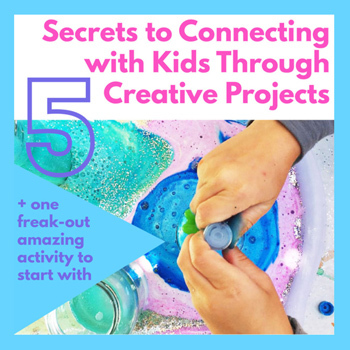 If you are doing this in a group setting you can have the kids prepare their filters by squeezing on the colors and letting them sit briefly before putting them in the spinner. The longer they sit they start to dry and then the rainbow color created by spinning is more pronounced. Try letting them sit for 10-15 minutes before spinning. 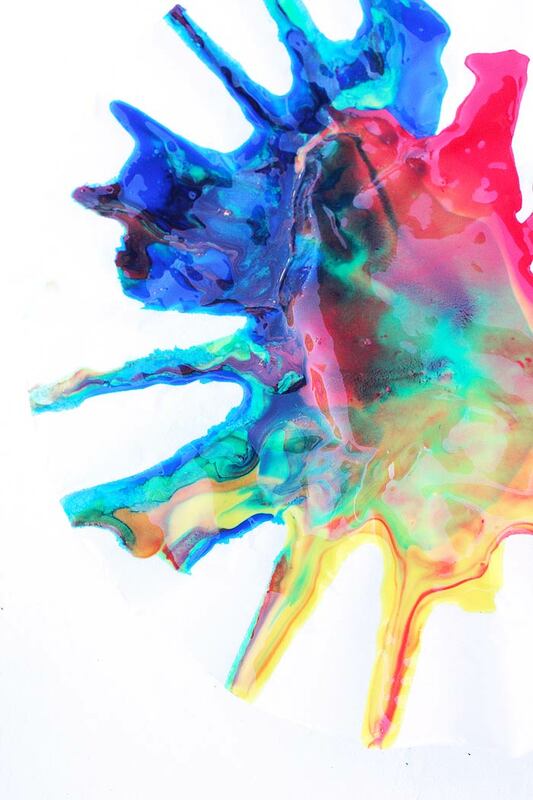 Try mixing only two primary colors at a time to demonstrate how secondary colors are produced. Don’t use the salad spinner for food after this! It’s best to purchase an inexpensive salad spinner for projects like this. 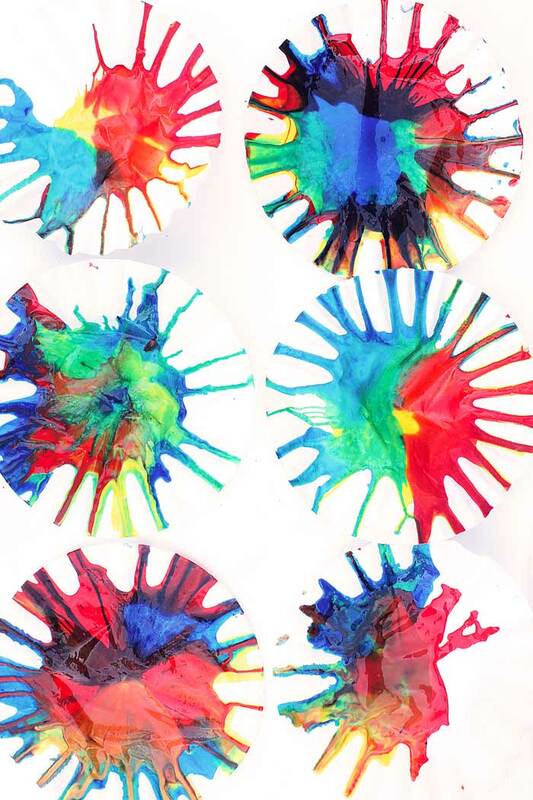 Spin art is always fun so you will get good use out of it. 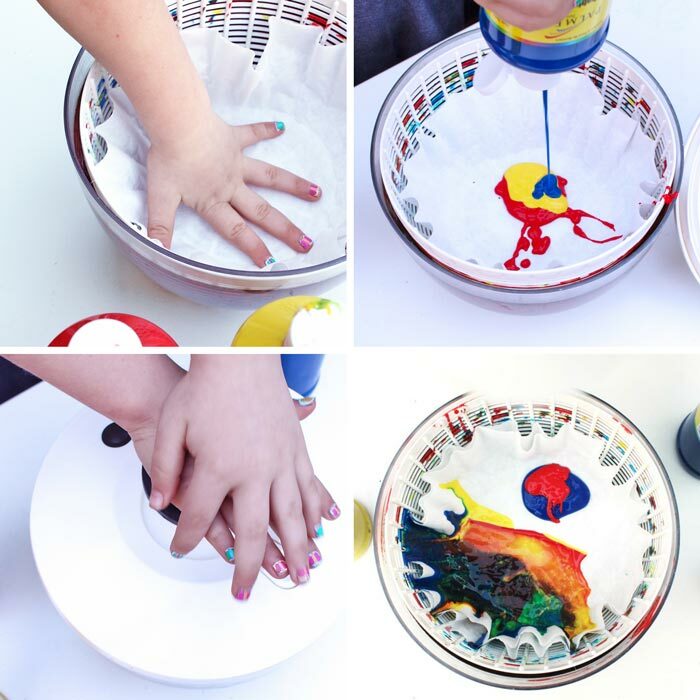 Other spin art projects to try are Spin Art Rocks from Meri Cherry and Spin Art from the Artful Parent. Color Theory Most colors are derived from the three basic primary colors: red, yellow and blue. You only need these three colors to create a rainbow. 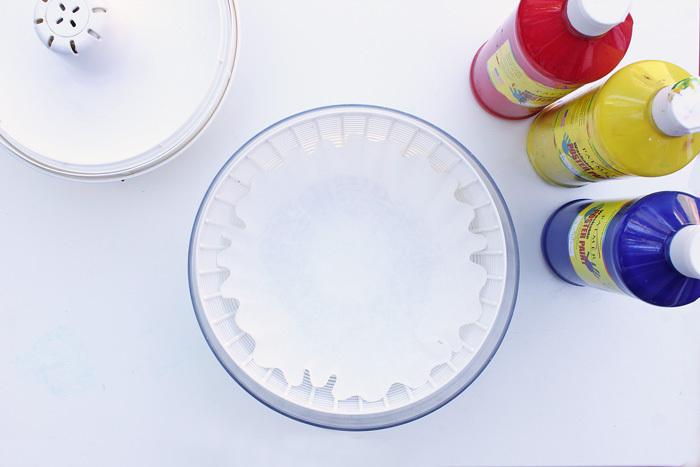 By placing the three primary colors in the spinner and mixing them you can create a whole variety of hues. It’s magical to watch green, orange, and purple appear in a matter of seconds. 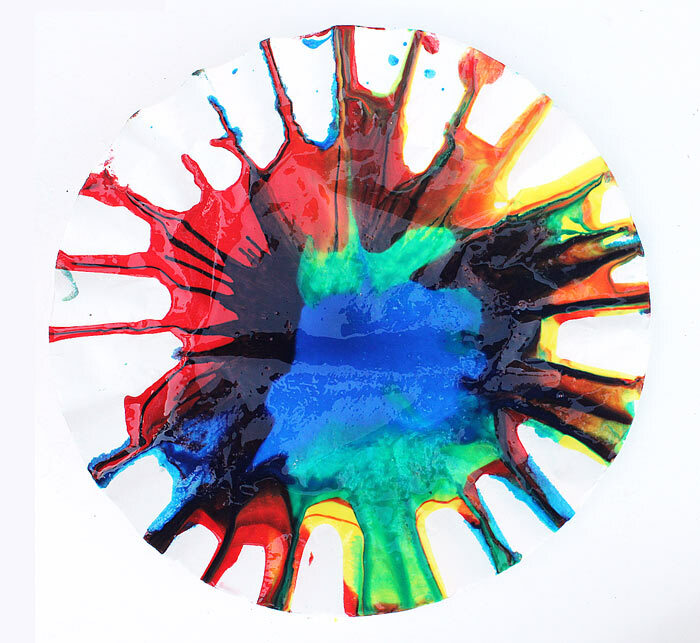 To explore more color theory hop over to our Play Dough Color Wheel Project. Centrifugal Force Centrifugal Force is not a real force. I just want to get that out of the way because it is often talked about like a real force though it is actually a demonstration of inertia, which is the tendency of an object in motion to stay in motion. Centrifugal force describes the tendency of an object following a curved path to fly away from the center point. In spin mixing the colors at the center of the filter are pushed outward when the salad spinner rotates, causing the colors to mix together. The concept of centrifugal force is used for things like the famous carnival ride the Round-Up (see below), merry go rounds, and tetherball. Frank Hrubetz. Frank Hrubetz was a mechanical engineer who founded the company Frank Hrubetz & Company, a manufacturer of several popular carnival rides that probably everyone has been on at least once in their life! One of the company’s most famous rides is the Round-Up, the carnival ride in which passengers stand against a circular wall and the ride spins and lifts into the air. The ride exploits the concept of centrifugal force, passengers are pushed against the outer wall as the ride spins. If you want to see something cool check out the 1964 patent for one of Frank Hrubetz ‘s rides The Meteor which is similar to the Round-up ride. 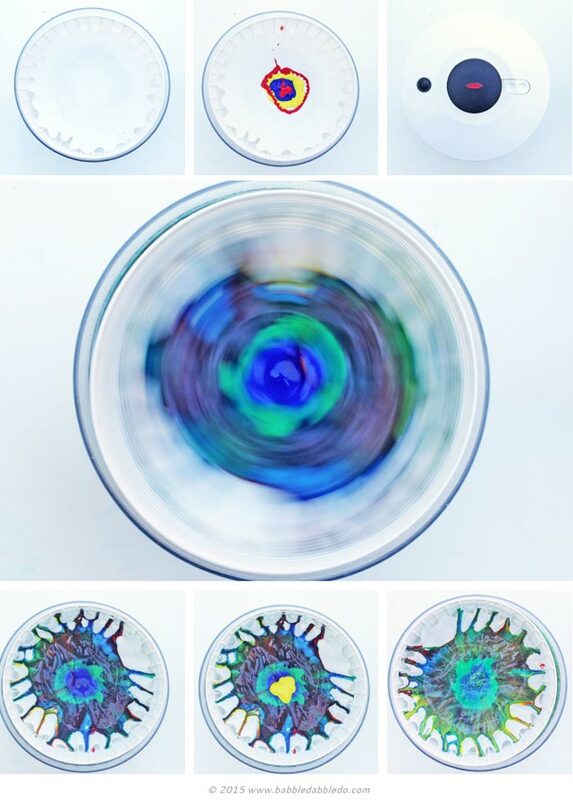 Even if your kids are too little to understand the concepts in this science art project they will undoubtedly have fun squeezing the paint and making spin art. And if they are older you can talk about color theory and even the physics behind this project. Either way you’ll have some lovely art to display and enjoy! 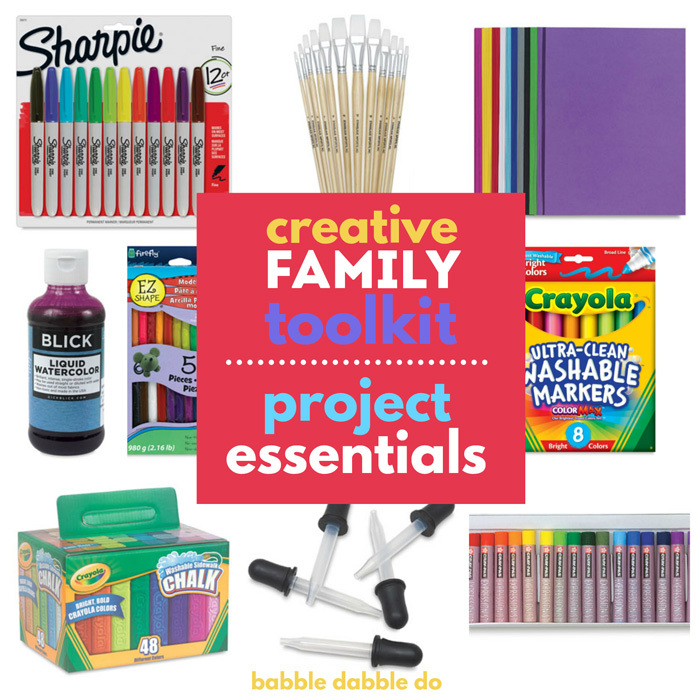 What a colorful, easy project! The kids and I loved watching the video. Great job Ana! Thanks for the fun idea! The link for purchasing the salad spinner sends you to the Amazon website. I purchased mine directly from IKEA at their Schaumburg, IL store and it was only $5. 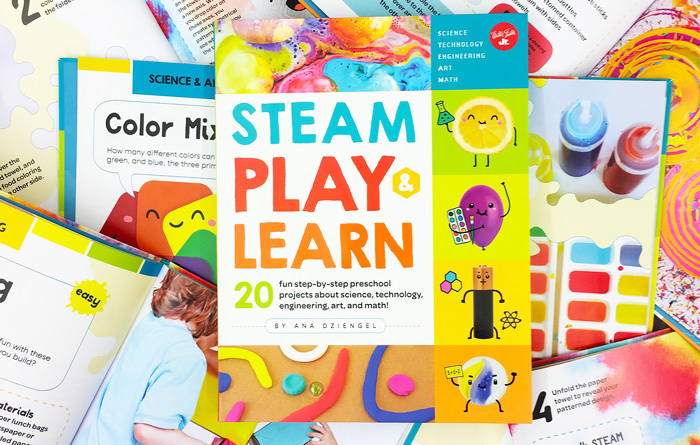 What a great tool for the classroom for art, science, etc! Salad spinners are the best for art! Thanks for letting me know about your blog Emma!